From Murmansk, we travelled north to Franz Joseph Land and then on to the North Pole. We expect to encounter ice at about 80 degrees North, sometime on Tuesday. 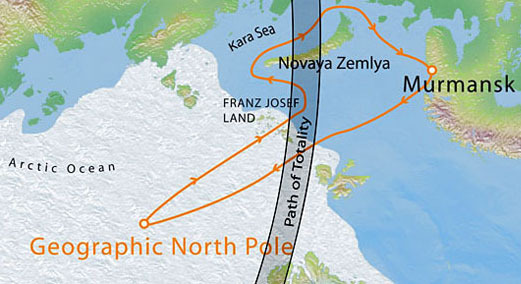 Upon our return we visit some of the islands of Franz Joseph Land and then sail to the southwestern side of Novaya Zemla to minimize cloud cover and maximize totality for the eclipse. 700 Nmiles - From Murmansk across the Bering Sea to hit ice around Franz Josef Island. 600 Nmiles through ice to the North Pole.